"He said I don't love him anymore, Can you even believe that? My married friend whined barely taking a break from her Margarita. I didn't say anything so she continued, "I mean I tell him I love him, at least twice a day...." "Maybe that's not his language." I responded nonchalantly. She looked at me like I spoke another language. 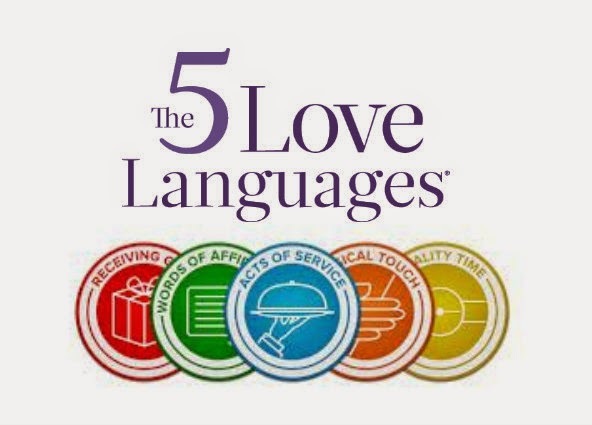 I recently came across an incredibly interesting book by Gary Chapman, "The 5 Love Languages". According to Chapman, there are 5 love languages and knowing and speaking your partner's love language improves communication and "keeps the love tank full". "I love you" doesn't always say it all. For a good amount of people, it only goes so far as to scratch the surface. In fact, even though it's something you should say often, each person has to "feel" it in a different way. So you're not lost in translation, you have to express your love in a way your partner understands. More so, you have to realize you and your partner probably speak different love languages. You have to love your partner in the way they want to be loved, and vice versa. For people who speak/understand this language, affirmative/positive reinforcement say it all. They like to be told they are appreciated and that their partner "sees" them. They like to be vocally acknowledged. For example, saying "You mean the world to me", "I am happy you are in my life", "you are a good mother","you look handsome tonight", and/or "thank you" for the little things/chores goes a long way. If you notice that compliments are like music to your partner's ears, here's a list of affirmative words that could make them smile. People who speak this language like undivided attention and spending time together. When you interact with them, they want eye contact to be reassured you are listening. They like to eat together. They need to feel like they are priority in your life and that no matter how busy are, you have time for them. If your partner lights up when you spend time together, make great effort to create snippets of time to spend with them. For example, when they walk in the door, put the TV on mute and hear about their day was, stop by at their work to take them out to lunch, wait for them before you have dinner or wake up five minutes early to have coffee or breakfast together. Find things you bond over, like TV shows or outdoor activities and create time to watch/do them together. People who understand this language feel the most loved when they have body contact. It can mean something as little as reaching out for their hand in public, rubbing their head or shoulder, kissing their forehead, warm hugs, cuddling or more. For them, touch and physical accessibility simply communicates love. For some, love is expressed by the act of giving; not only during special occasions like birthdays or anniversaries. Gifts mean more when it is "just because". After all, love is enough to celebrate everyday. They are not necessarily materialistic and the gifts don't have to be expensive or big. It's the thought that counts. For example, if you stop by the grocery store on your way home, you can pick up a single rose for your girl or if you're at the mall, you can pick up the smoothie your man likes. Beyond gift-giving, some just don't like to simply hear about love, they like to see action. It may mean doing house chores, taking your girl's car for an oil change, packing your man's lunch for the next day, or giving each other a massage. At this point, if you're still wondering what your love language is (so you can tell your partner) or what your partner's love language is, so you can speak it more often, it's pretty easy. You just have to pay attention, when is your partner happiest? what do they complain the most about "needing"? If you're still stuck, take the Chapman's quiz. Trust me, it's not only fun, it's worth it. I hope that inspired you to love better.